Enerpac equipment being used at the Newcastle Knights Stadium. COMPACT high-pressure hydraulics driven by some of Australia's most advanced electric pumps were launched into service in Australia recently to position a stadium roof at the home of the Newcastle Knights rugby league team. Coates Hire Industrial Service used 12 groups of 700bar (10,000psi) Enerpac hydraulic cylinders to complete the job. The cylinders were driven by pumping combinations, including the latest quick-acting Enerpac ZU4 pumps, to lower the 1500t cable-stayed roof counterbalanced atop the new Eastern Grandstand of the Energy Australia stadium in Newcastle. The safe and trouble-free hydraulic positioning technology used in the project is applicable to a wide range of construction and infrastructure projects, as well as resource and industrial projects involving the positioning of very heavy weights with very high precision. The $30m, 12,500-seat Newcastle stadium built by John Holland Constructions features a cable stayed cantilever steel roof about 140m long and 25m deep. Prior to final positioning, the main weight of this flexible, counterweighted roof rested on the rear structure of the stadium, with the balance of the weight projecting forward onto 12 tubular steel temporary props supporting its leading edge. On the day of the lowering, the bases of these temporary props were to be telescoped hydraulically to release the forward weight of the roof. Working to a materials handling program devised by Consulting Structural Engineer Peter Burns, the hydraulics were designed to lower the roof gently and evenly into place while ensuring there was no distortions across the structure, as the permanent cable stays took up the permanent load they would share with the permanent concrete supports. "In the case of the Newcastle project we needed to use a better, more finely controllable system than traditional arrangements using wedging systems or sand jacks," said Mr Burns. "In addition to protecting the roof against unwanted flexing and ensuring precise positioning, we were dealing with considerable weights. The stability of the roof relies on a heavy concrete counterweight positioned near the leading edge of the roof. "The stadium's method of construction and counterweighting was chosen because of the nature of cable-stayed roofing,” said Mr Burns. “This type of roof design is great for holding a roof up in the air, but relies on the counterweight to protect against wind uplift. With the additional weight this entails each temporary prop was required to support about 60-70t." 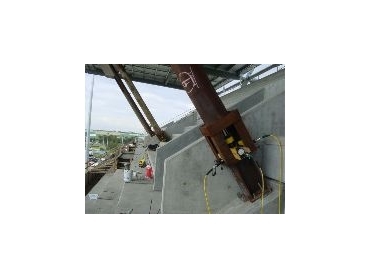 The Enerpac hydraulic system designed and supplied by Coates Hire Industrial Service included three compact Enerpac hydraulic cylinders at the base of each the 12 temporary supports. Contained within box structures fabricated from heavy steel angles, each of the 12 triple-cylinder installations included one RC1006 95t single-acting cylinder complemented by two 25t RC 254 cylinders. The compact cylinders (the RC 106 and RC254s have outside diameters of only 177mm and 85mm respectively) were nestled within the box structures atop short stub columns, supporting the base of the temporary stays until the time came for the lowering. When this time came, plate supports atop the box structures were released to permit the cylinders to take the load and to retract. "We set it up so the actual lowering operation would be quite straightforward,” said Mr Burns, who worked with John Holland Constructions Site Manager, Steve Chaseling. “The entire operation took about a day, with the roof moving down evenly and in a controlled manner. Most of the work was in the planning and design. “Although we needed to lower the roof less than 250mm, this had to be done extremely carefully to avoid warping of the structure." The bigger cylinders, with a 168 mm stroke, controlled most of the descent as the counterbalanced roof eased down the final millimeters into place. The smaller cylinders, with 102 mm strokes, were positioned each side of the larger cylinder to provide additional stroke, if the job required it during the final stages. By this stage, the load to be controlled was much reduced, as the roof's cable-stays took up the correct cable tensions required for permanent support of the roof. The hydraulic circuit provided by Coates Hire Industrial Service contained Enerpac V66 manual load holding valves for safety and control, with in-line pressure gauges connected to combinations of PUJ1401E lightweight and compact pumps and the new ZU4 pumps. The new pumps feature a self-priming, high-flow first stage that increases pump performance by supercharging the second stage piston pump, improving oil flow in both hot and cold weather operation. The Newcastle stadium project was one of the first major projects in Australia involving the new ZU4s, which are engineered to run cooler than conventional designs while offering greater durability, lower operating costs and simpler service. According to Coates Industrial Hire Services' Colin Chapman, the powerful 1.25kW ZU4's light weight and compact design make them ideal for applications requiring heavy duty and easy transport. Their universal motor works well on long extension cords or generator-driven electrical power supplies. Typically weighing between 26-33kg, with reservoir capacities from 4-40L, the 700bar pumps are suitable for use with powerful and compact single-acting and double-acting high-pressure hydraulic cylinders and hydraulic tools used throughout Australasian industry. The ZU4 series portable hydraulic pumps couple their increased power with a totally new pump element design that reduces oil flow turbulence, producing an industrial workhorse with fewer moving parts and less friction. Their high-efficiency two-speed pump design requires 18% less current draw than comparable pumps. The high-pressure (700 bar, 10,000psi) equipment employed on the Newcastle Stadium project is available throughout Australia and New Zealand from Coates Hire Industrial Service and from the national sales network of Enerpac, which is part of the global Actuant Corporation.